How A Manual Treadmill Can Teach You To Run, And How To Use One Properly (Even At A Desk). In both those resources, and on many podcasts (including this one on “How To Burn More Fat At Work), I've talked about and featured a special kind of treadmill called a “TrueForm” treadmill. Treadmills with motors – the kind you’d normally need for running, and the kind typically used at treadmill workstations – are not only big and bulky, but produce enormous amounts of electromagnetic fields (EMF) and “dirty electricity”, which has been linked to brain fog, altered cellular metabolism, cancer risk, and much more. 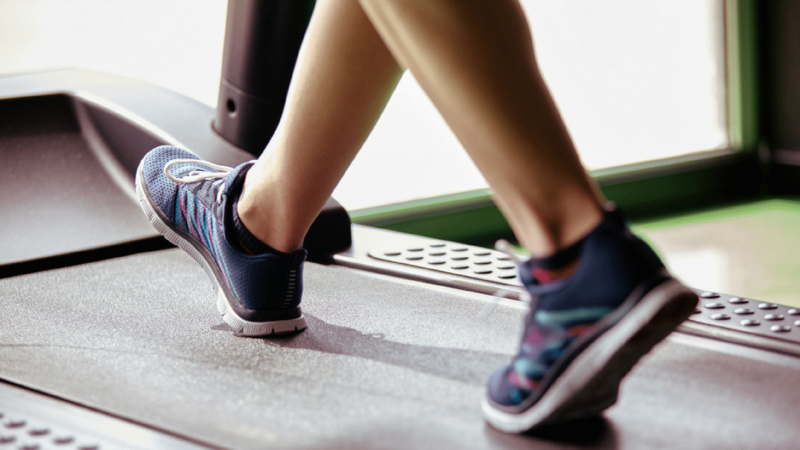 In addition, a treadmill belt that runs on a motor allows you to walk and run while leaning slightly backwards and engaging in a full-on heel strike, which alters your running and walking gait, destroys your biomechanics and can actually turn you into a worse runner or a sloppy walker. 2. Manual Treadmills Are Too Slow For Running. So a non-motorized treadmill (also known as a manual treadmill) is a good solution compared to a motorized treadmill. But the problem is that most manual treadmills only reach a maximum speed of 3.5-4.0 miles per hour, and this means that you can never use a manual treadmill for running. Since I wanted to intersperse short fitness and metabolism boosting sprints into my walking workday, (e.g. stopping every hour to do a brief 2 minute sprint, or doing a bit of jogging in between consults and phone calls) this means I’d have to buy and find space for two separate treadmills – one for walking and one for running! So over several months, I searched high and low for a treadmill that is A) a manual treadmill without a motor; B) compact enough to fit under my standing desk; and C) didn’t produce electrical pollution and D) could operate at both casual walking paces, light jogs and high running speeds. The solution that I eventually found is something called a “TrueForm treadmill” made by Samsara Fitness. The unique looking TrueForm has several extremely unique characteristics that set it apart from any treadmill on the face of the planet, and is unlike any treadmill you’ve ever tried. First, there is no motor and there are no buttons. 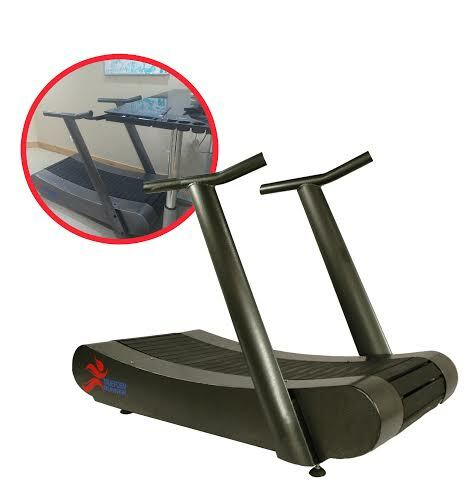 The treadmill is entirely manual and is powered by you, which means that you are not only exposing yourself to zero electrical pollution and saving 100% on electrical costs, but also moving far more naturally due to the non-motorized belt design. When you walk on a TrueForm treadmill, you burn more calories, get better balance (especially if you don’t use the rails) and build stronger leg and core muscles, since you’re doing the work instead of a treadmill motor. And the faster you move, the faster the treadmill goes, just like when you walk, jog or sprint outside. But it gets even better, because the TrueForm treadmill is the first and only treadmill to actually teach you the skill of running. This is because the only way to really get the belt moving is to lean slightly forward, strike with your mid to front-forefoot, and maintain a high cadence, which means your body learns to run exactly like the most elite runners on the face of the planet run. This honestly took me a little bit of getting used to, because I’m used to being able to “lean back” and be lazy on a treadmill, and frankly, this treadmill instead forces you to move with pristine form. Finally, the rails are removable. And although TrueForm is legally required to send you the treadmill with the rails attached, you can take them off for the ultimate balance-enhancing experience as you walk, jog and run. So that's great and all, but can this thing really teach you how to run with proper biomechanics? On today's audio podcast, I get Jeff Vernon the owner of Samsara Fitness on the show and we address this question and much more. Do you have questions, comments or feedback for Jeff or me? Leave your thoughts below and one of us will reply! The Trueform looks awesome, but out of my price league. Is there a cheaper alternative which has similar attributes? I’m looking for a smooth manual treadmill which is simple to use but effective, and this one is making me scratch my head. Wish they can be also found in India, I am facing exact problem you told here, but still I prefer Manual treadmill over motorized. Edit: it seems that I did not adequately proof read my extremely long post very well… There are several commas missing, one here, one there, and oh yes also over down there as well. The word “consider” is also misspelled at some point. God speed you to the completion of your first treadmill-desk and best wishes in general! It is suprisingly nice!! 46″ belt, 3 incline settings, and 8 level silent magnetic resistance. This is a traditional low tech manual mill and thus you are basically perpetually moving uphill! Step for step I bet it would best a fancy curved one in terms of calories burned hands down!! If you run on it and i do mean run, (I have not tested max speed on the highest incline setting but im guessing 6-7mph easy) it is pretty easy to control, set incline to high resistance to maybe 3-4 and off you go up a 13% grade until you eventually have to give up!! It takes a good bit of concentration and balance! I can still read the internet just fine while I walk. Many cheaper models have no resistance device and IMO would be unusable for a desk rig, without resistance you are quickly “encouraged” to walk faster, and then begin jogging. To prevent this you have to hold on to the rails and that precludes the use of a mouse and keyboard. Anyway I can’t say enough good about my rig! For a desk I got some genuinely fancy HEAVY thing with a height adjustment knob (like a manual car window) the table top is a U shaped affair of SOLID PLATE STEEL!! 1/4″ it weighs like 100 pounds! It is very nice to have it wrap around for elbow resting while typing, however running is a bit hampered by this design. The plate steel top is sturdily bolted to the legs with 16 bolts, i have concidered replacing it with plywood that does not wrap around because i want to be able to drop the resistance to 0 and break out into a merry sprint without nailing my arms on this desk top which is quite literally sledge hammer proof!! If you are are creating a home office or work in a laid back environment and already have a nice desk, slap a double-stack of cinder blocks under the corners and BAM! Youre good to go! I added a gibbons mounts dual monitor arm (which i also highly reccomend) a microsoft ergonomic keyboard and a cheapo “velocifire” vertical mouse and you I have got a mad ergo liposuction machine of the gods! Getting a small fan soon, tonight I added an auxiliary miniature travel mouse to use as a handheld scroll wheel for reading! I’m hammering out the quirks as i go..
And yeah a fancy curved surface contraption might be a bit more mellow, but I like the endless hill climb! Fitness awaits at the top of the mountain! About two years ago my brothers GF was freaking out like “i want a woodway, I want a woodway! !” Needless to say they could’t afford one! They got a handmedown Nautilus machine from my dad instead. It is a fine thing if less rare and goes up to some ridiculous speed like 15mph. An enormous 2×4 and plywood hamster wheel also came to mind… Similar concept in terms of the curved arc shaped running motion, fewer moving parts, muuuuch cooler!!!! If you really got it up to sprint speed and then fell down you would probably be carried loop-de-loop several times just like… well… a hamster. On that note, goodnight everyone. I hope my posting helps someone! I had more than one adventure cobbling this rig together and it really works well! As they say. Thanks for the info! I knew nothing about treadmills… now, thanks to you, I know! 5600 for a non motor treadmill. Talk about profit margins. Thing probably cost 400 to make. Same with the Woodways. If they were smart and not greedy,they would cut the prices and sales would jump. Profits would be more in the long run. Then again,they would have to work harder,and who wants that right?